Dress Code: Cover the naughty bits. Before I moved to Florida 8 months ago I lived in Dover, Delaware for 6 years. Delawaaaare??? you may ask...exactly. It is a little state attached to the eastern side of Maryland - between Pennsylvania and Virginia - in actuality if you blink you will miss it. My hubby was stationed at Dover Air Force Base, so it was home for a while. 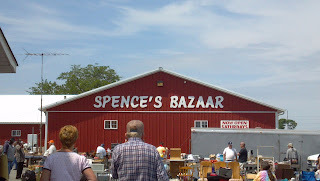 While living there one of the few gems we found in Dover was Spence's Bazaar. From the outside it looks a little run down ( I call it country chic) and if you pass it on a closed day you might wonder what the heck it is doing there. But on an open day it is an instant traffic jam - the parking lot full, streets lined with cars, and people all over the place! 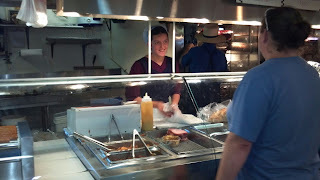 I spent many a Tuesday, Friday and Saturday walking through the grounds and eating at the delectable Amish deli..err meat market...hmm hot food..bakery?? Ok, let's just say they have one of everything. So when we recently took a trip back to Delaware to visit some of our extended military family we just had to go! When you walk into the food building it is...for lack of a better expression... a cluster f&$%. I have never seen this place empty. Tons of people, many different kiosk type stations, and so many many delicious smells and sights. As always, I scan everything then enter the long line for the sandwiches. Just a sandwich you say? Well they are not just sandwiches. They are little havens of Amish deliciousness. 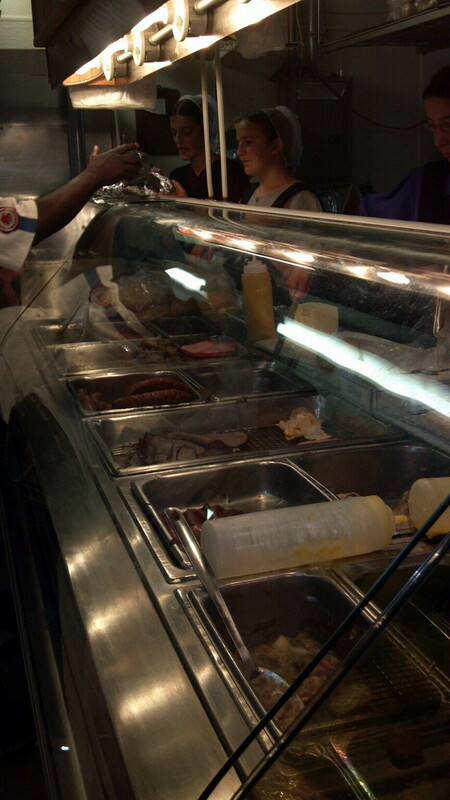 They have between 5-8 people working the deli bar so the line moves pretty quick. The pulled BBQ pork and chicken are really what they are famous for - and both are delicious. But one of my favourites is their ham and cheese. The buns are soft and fresh, cheese full of queso-y goodness and the ham....mmm the ham. As you walk up you see the meat - hams, chickens, ribs (oh yes they have ribs) all getting their rotisserie on in the back. 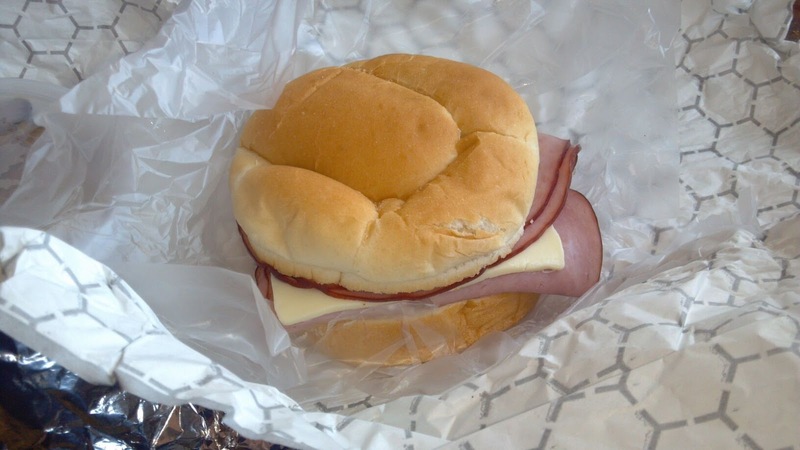 They take that ham (yes, the one full of slow rotisserie goodness) and put a pile of it on your sandwich. I am talking like 5-6 large slices of ham goodness. And if that wasn't good enough - there is the mustard. Now I am not a mustard person. I do enjoy honey mustard - but that is more so because it tastes like tangy candy. So when I was told to try their house mustard I was sceptical. But O-M-G. It is delicious. It is their "sweet and spicy" mustard. It is more sweet than spicy but just make sure to ask for only a little mustard - or you can end up having a mustard with ham and cheese sandwich. Spence's is a simple place. Simple and delicious. There is a reason they have been around for 75 years. So go on - smile at the cute men and women in uniform, sample some cheese and have yourself a delicious meal. You will want seconds...or maybe a pumpkin whoopie pie (trust me *drool*)! I should have packed the stretchy pants!